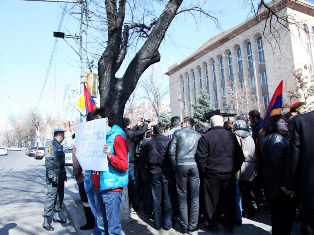 Protest in front of Constitutional Court of Armenia. About 20 young people tried to carry out a protest action in front of the building of the Constitutional Court of Armenia. They displayed the Armenian tricolours and a poster saying 'We demand to ratify the victory of Armenian people', Armenian Report wrote. The action was stopped by the police and the demonstrators tried to continue on the corner of Baghramyan Street. According to the young activists, this time the Constitutional Court should finally make a fair decision. The Armenian Constitutional Court has begun considering the claims of former presidential candidate and leader of the Heritage Party Raffi Hovannisian, to annul the presidential election results of February 18. 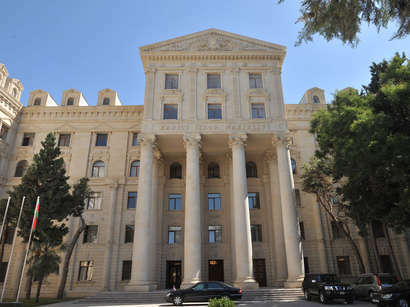 The Constitutional Court decided to unite the cases on the claims of Hovannisian and another presidential candidate Andreas Gukasyan as they are related to the same issue. The defendant is represented by the chairman Tigran Mukuchyan and co-defendants are the Attorney General's Office represented by deputy prosecutor generals Vagram Tamazyan, Koryun Piloyan and Harutyun Harutyunyan, and Armenian police represented by Tatul Petrosyan. The chairman of the Constitutional Court Gagik Harutyunyan noted that the incumbent president Serzh Sargsyan has also sent a claim as a third party. His interests are represented by Minister of Justice Hrayr Tovmasyan and MP from the Republican Party David Harutyunyan. The latter took a 10-day vacation to submit the claim. Raffi Hovhannisyan's authorised representative is lawyer Karen Mejlumyan. Additional credentials are given to the head of the electoral headquarters Zaruhi Postanjyan. Andrias Ghukasyan defends his interests in court himself. According to the official results of the presidential elections, Raffi Hovannisian ranked second and the incumbent president Serzh Sargsyan won the first ballot.